"Her voice is full of money." Homage to Gatsby. You say apartment, I say flat. 6. Make sure you tell the person who tagged you that you've taken part! My Mistress' Sparrow is Dead, edited by Jeffrey Euginides. It's a collection of essays and stories about love - but none of that schmaltzy stuff. It's all about love as characterised by loss. It's wonderful thus far. Captain Corelli's Mandolin - it passed me by. Anything by Rushdie. Never read him - despite the death fatwa, which is a bit of a pull, I'll admit. The Wrong Boy by Willy Russell. Bedford is always banging on about it, and it's got a Smiths connection which should have been enough reason. Haven't gotten around to it yet, though. I have given up magazines, deciding that they're destructive to self-confidence and consumerist-encouraging drivel. Oh, I AM lofty, ain't I? I started buying the occasional health and well-being magazines (WOMEN'S RUNNING, grr) but realised that they essentially print slight variations of the same articles every month. The only regular publications through the Bedford door are Farmers' Weekly and Private Eye. I only read the 'Farmlife' section of FW, and Matthew's column when he's in. What’s the worst book you've ever read? What book seemed really popular but you didn't like? Birdsong. Just couldn't get into it. Maybe I need to try it again. Currently, The Marriage Plot by Euginides (quelle surprise). However, previously, Extremely Loud and Incredibly Close by Jonathan Safran Foer or The God of Small Things by Arundhati Roy. They tend to bring on a 'OHMYGODYOUREALLYNEEDTOREADTHISHERE'SMYCOPYTAKEITTAKEIT! '-type conversation. 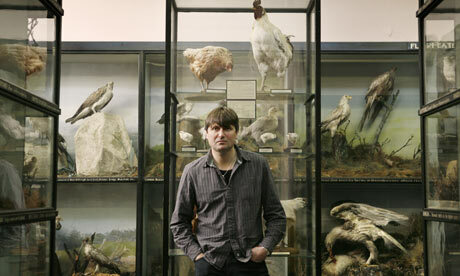 Um, in which case I think Out of the Blue by Simon Armitage - a very human account of 9/11 - is pretty mind-blowing. An Arundel Tomb by Larkin is a typically-Eeyore-esque (and therefore Right Up My Street) reflection on the transience of life and love. And Macbeth's 'Tomorrow and tomorrow and tomorrow' solilquoy is so utterly nihilistic that it cannot help but speak to my miserable side. And is written in verse so it counts, yeah? I tend to have a big quartley splurge in a second hand book shop (see recent trip to Hay). Otherwise, Amazon. Sorry. I remember going to the Galleries library and getting out Puddle Lane Books. Then I remember being in the elite reading group at primary school; we were allowed Different Coloured Banana Books to everyone else. Woah. I read anything and everything, including the back of the cereal box. The Marriage Plot, Jeffrey Euginides. Couldn't. Stop. Reading. Yup. Bleak House was a set text in my first year at University; I used it as a door stop and not much more. I have a few versions of Gatsby because they were too beautiful to resist. 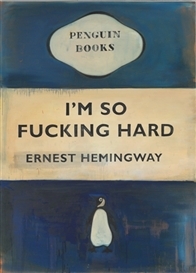 I love Faber and Faber covers, though. 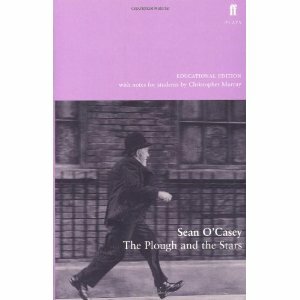 I bought Sean O'Casey's The Plough and the Stars because it was just too beautiful for words. Never read it. Criminal. Mallory Freakin' Towers. The My Best Fiend books. The Anastasia books. Sweet Valley High. Emily of New Moon. I was a completely indiscriminate reader. I remember being thirteen and reading Jane Eyre alongside Maeve Binchy's Light a Penny Candle. And I might have cried more over Light a Penny Candle. 'Changed your life' is quite a bold statement. However, John Diamond's The Big C was a bit of an early branch-out for me from the usual stuff I was reading at the time, and you're all the better for branching out as a reader, I fink. What are your top five favourite authors? Mebbes. This could change pretty regularly. I love the Foyle Young Poets books, which periodically drop into my pigeonhole at work. There's a lot of unspeakably good young talent out there. Anything by Alan Bennett - Maybe Untold Stories as a cheat, as it includes so many different examples of his writing. The End of the Affair, Graham Greene. Once in a House on Fire, I think, was Ashworth's first book, and is wonderfully accomplished. P'raps Jane Eyre. It was the first classic I loved. Tarry Flynn - Patrick Kavanagh. I wrote about it here. Sons and Lovers - DH Lawrence. I love its earthy diaglogue and the entirely accurate representation of family tensions. Why Be Happy When You Could Be Normal? - Jeanette Winterson. Found it in a bookshop in Bangalore (err, how?) and devoured it. Extremely Loud and Incredibly Close - one of the most quotable books EVER. Tender is the Night - F Scott Fitzgerald. Better than Gatsby. Now there's a claim. I got this Q&A from this lovely blog, and I shall endeavour to tell Louise that I have nabbed it. To tag? Well, Bedders should get off his backside and write summat. Really, this is a more developed Books That Made Me Me slot, but I like it because you get to slag off books you hated, too. Hurrah. I'm off to Bruxelles pour le half-term, innit? You'll be glad to hear I'm going to do an intensive French course over the summer so my Franglais may not be with us for much longer. Enjoy it while it lasts.